If you were holding out hope that the Matt Kemp trade was just a dream then you might not want to read on. Matt Kemp has just sent along his goodbyes to Dodger fans everywhere, via his Instagram. Although the trade that sends him to San Diego has yet to be confirmed officially, I have to believe it's a certainty now. Thank You, Matt. May 'Beast Mode' flourish down south. I will certainly be paying attention to the going-on's in San Diego now that you are there. Obviously, I'll be rooting for ya; except when you face the Dodgers. Photo at the very top, via Jon SooHoo/LA Dodgers 2013. I wouldn't be surprised if relief pitcher Chris Hatcher ends up being an important piece to the Dee Gordon trade. As you know, the Dodgers acquired Hatcher, along with a bunch of other prospects for Gordon, Haren and Rojas. He is a recently converted catcher, much like Kenley Jansen, and ended up turning some heads last season. You may follow him on twitter here: @handlebars41. He should slot in nicely as a middle reliever, and could very well be a steal for the club. His acquisition is clearly a reflection of smart Baseball people finding value when others (namely Colletti) would have just gone after over-the-hill has-been closers to fill those roles. We like Hatcher quite a bit. We feel like he fits in really well within the constructs of our current bullpen and really lengthens our pen. He’s got really good stuff, misses bats and we feel like has a chance to really help us in 2015 and beyond. Of note, earlier this year Hatcher beat the crap out of a teammate in AAA. Per Darrell Williams at The New Orleans Advocate, "Zephyrs’ Chris Hatcher suspended five games after fight." New Orleans Zephyrs All-Star relief pitcher Chris Hatcher was suspended five games by the Miami Marlins after a fight with reliever Sam Dyson resulted in Dyson’s jaw being broken. The fight occurred at a Nashville bar on April 29 during the team’s just-completed eight-game road trip, a source in the organization said. Hatcher refused to disclose the reason for the fight. I guess you don't want to get on his bad side. In celebration of Hatcher's arrival to the Dodgers I made the above fantasy card for him. I used a photograph grabbed from a photo from Zimbio (Chris Trotman/Getty Images North America) and the 1971 Topps Baseball card design. Just when I was marveling at the Dodger acquisition of Baseball's 2nd best left-handed starting pitching prospect, Andrew Heaney, the Dodgers go ahead and flip him to the Angels for second baseman Howie Kendrick. And, I couldn't be happier about it. Paired up with soon-to-be shortstop Jimmy Rollins should be a wonder to behold. This will be one of the better infields the Dodger have had in quite some time. As for Kendrick's contract, he has just one year remaining at $9.5Mil - a bargain if he comes anywhere close to his numbers from last season. I might usually bark at the idea of trading a top-flight prospect like Heaney for a one-year rental in Kendrick, but as I'm slowly coming around to understand this deal (like the others) is about roster flexibility. We get a great bat and solid defensive middle infielder for one season; which allows us to stretch our wings out a bit when next winter rolls around. Besides, if we are unable to extend him beyond 2015 you can be certain that the Dodger make a Qualifying Offer. And as you know, that extra draft pick has significant value. "The Angels found him, if only by chance. On a whim Kotchman went to see Kendrick play in Tampa in early 2002 after hearing about him from Ernie Rossean, the coach at Brevard Community College outside Orlando. After watching a few minutes of BP, Kotchman ran to his car to get his video camera. "My goodness, the kid hit the ball," he recalls. "I couldn't believe there weren't other scouts there. And other JCs cut this guy? What were they thinking?" For the remainder of the season, Kotchman wouldn't even approach Kendrick at games, lest his secret get out. In '02 Anaheim took Kendrick in the 10th round of the draft. As for why he went undiscovered for so long, both Kendrick and Kotchman are somewhat flummoxed, though each ends up blaming geography. "His school was way out in the sticks, and he didn't play summer ball," says Kotchman, whose son, Casey, played alongside Kendrick on the Angels. "Hey, I'm just glad we were the ones that found him." In celebration of Kendrick's arrival to the Dodgers I made the above fantasy card for him. I used a photograph grabbed from a photo from Zimbio (Rob Tringali/Getty Images North America) and the 1962 Topps Baseball card design. This morning I woke up and leaned over to grab the remote. I turned on the television, which was already tuned to the MLB Network, and rested comfortably as I wondered if there was any more Dodgers news to hear. Then, before I could stretch out my limbs a feeling of pain and loss ensued. Suddenly, I didn't want to get out of bed. 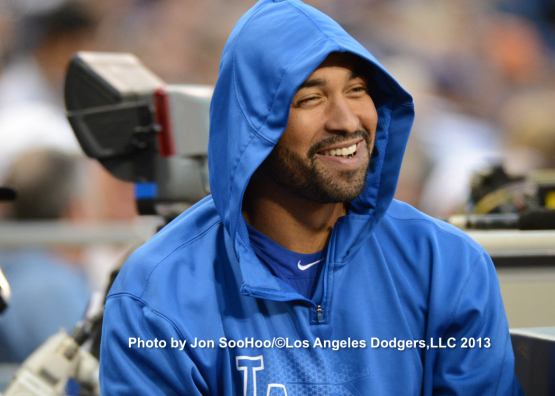 The first words I heard out of that tv included the phrase, "Matt Kemp to the Padres," so my heart immediately sank. Dammit! These guys are a bunch of uncaring, unfeeling monsters! In a span of 24 hours the Dodgers went from being spectators to an hyperactive child. It's like I was sitting comfortably on my couch enjoying a stout brew only to be interrupted by some unruly neighbors bent on upending my life. At one point last night, I was happy with the Dodgers' activity during the Winter Meetings. We had seemingly added Jimmy Rollins, Howie Kendrick and Chris Hatcher for Dee Gordon, Dan Haren, Miguel Rojas - with some prospects, here and there, to even things out. Furthermore, confirmations were coming in from all corners claiming that the Dodgers had also signed free agent starter Brandon McCarthy. So last night, as I was putting my head on my pillow, I was having the kind of feeling that conjures up dreams of endless beaches and puffy clouds. 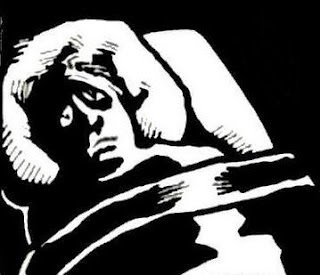 Now, as I wipe the sleep from my eyes, I realize that that was all an illusion. We are in a cold hard world, and we are just mere spectators to it all. I get the reasons for the aforementioned deals. I don't understand the most recent trade with the Padres. Crap! I had a hard time writing that last paragraph. Oy Vie! What's a fan to do? I think I need to turn off my twitter feed. It's driving me crazy. Can somebody give me a hug? 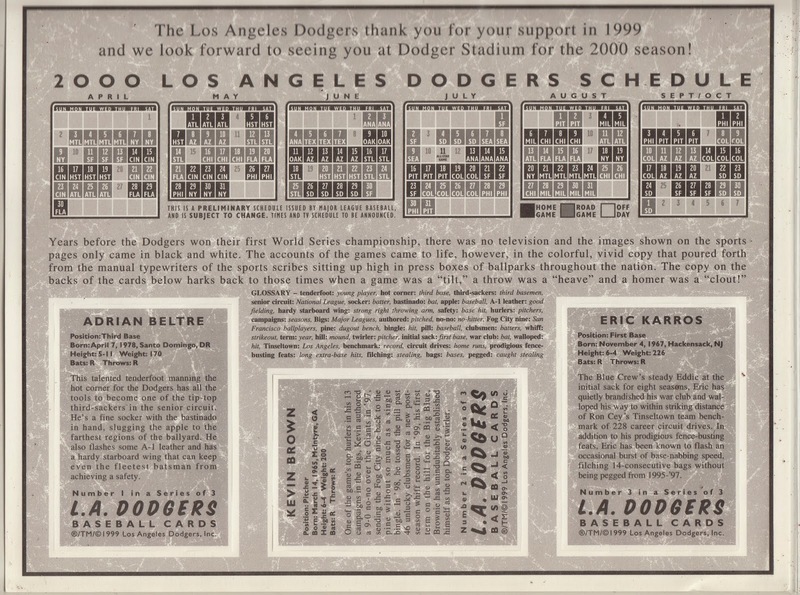 I'll have some more about the past day soon; including some fantasy card creations for the new Dodger players. Gordon began the class by leading the students in a brief fitness routine along with Dunaway and shared the warm-up exercises he uses before games. While Dunaway led a discussion on the importance of daily exercise and getting your basic food groups in each day, Gordon pulled up a chair and joined the class in eating breakfast. Sadly, yesterdays public appearances within the community was Dee's last moments as a Dodger. As reported by Roberto Baly on twitter, Dee received a phone call notifying him of the trade during his appearance and he has a photo to prove it. Via JP Hoornstra at Inside the Dodgers, "On Corey Seager and the Dodgers’ pursuit of a shortstop." Craig Calcaterra at Hardball Talk ranks, "Baseball’s Most Handsome Managers: 2015 Update." 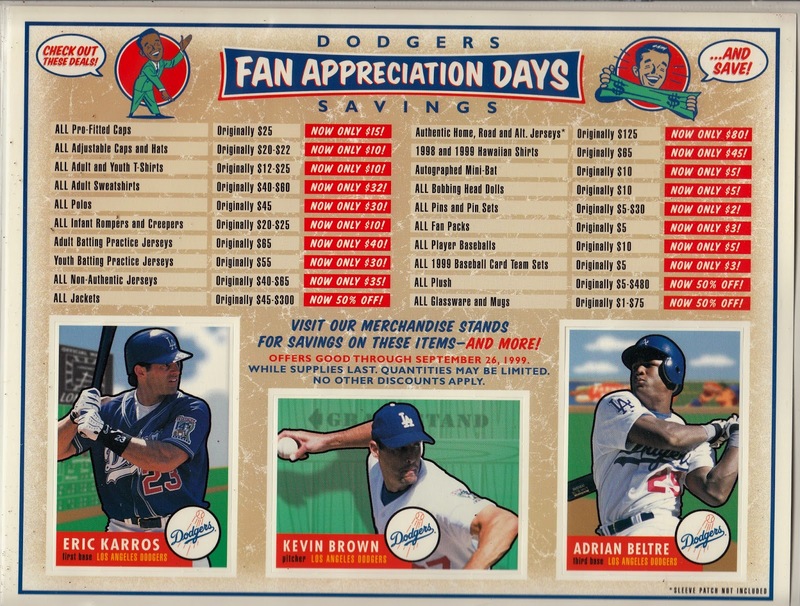 Check out where Don Mattingly fit on the list. Via Teddy Cahill at MLB.com, "Fall League names 22 to Top Prospects Team" and three Dodger prospects made the list - Scott Schebler, Corey Seager and Darnell Sweeney. Via Mark Saxon at ESPN, "Don Mattingly rolling with the changes." Via Jeff Sullivan at FanGraphs, "Marlins Pay Steep Price to Not Get Better." I’m not sure if this is the worst move of the offseason. If it is, I’m not sure if this will remain the worst move of the offseason. But my later response continues to match my initial response: Andrew Friedman and the Dodgers are making out like bandits, successfully selling Dee Gordon about as high as possible. The Dodgers are losing a probable regression candidate, about to enter his Super-Two seasons. They’re getting probably the Marlins’ best prospect, and then even more to boot. The Dodgers picked up some more long-term assets. The Marlins might not have gotten better at all. Via Carson Cistulli at InstaGraphs, "Austin Barnes Is the Jewel of This Trade by the Projections." The Cubs appear to be going places. As you know, they are reported to be the winners in the Jon Lester sweepstakes and now we are reminded of this. Via Mike Oz at Big League Stew, "Reminder: The Cubs won the 2015 World Series in 'Back to the Future 2'. NO WAY! They actually have the pieces to make this really happen. RT"@Cindyluellis: I don't know how to break the news 😢. 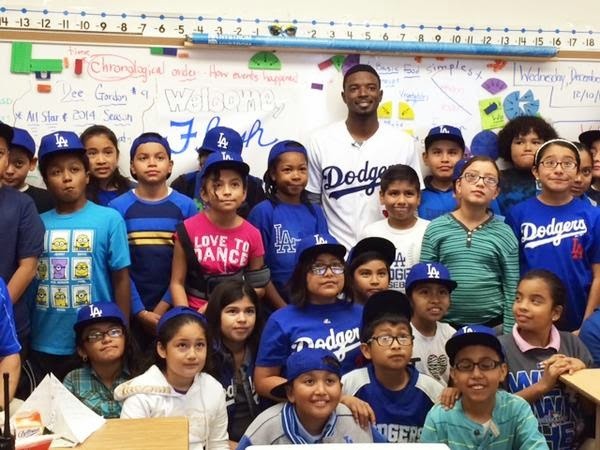 We are sad @FlashGJr pic.twitter.com/PkcXPcBmyC” Great man, teammate & role model.